What I am about to say will probably anger you. As a black Christian, I have struggled with whether or not to address this sensitive topic. I only ask that you give my statements prayerful consideration. Ninety-six percent of black voters, many of whom are Christians, cast their votes for Barack Obama. I question: Did your desire to see a black man in the White House trump your commitment to Christ and Christian values and principles? While I believe many white Christians also made a racist decision by voting for Obama solely because he is black, I am taking this occasion to address my fellow black Christians. Now wait a minute. I know the hair is rising on the back of your neck. Don't go crazy on me. Please hear me out. My family and most of my black friends are Christians striving to live lives which honor Christ. And yet, there is a huge disconnect between their Christianity and their irrational, blind, and near-idol-worship of Obama. Will the truth about Obama make a difference? For some, I think not. For those of you who value your commitment to Christ more than your loyalty to skin color, here are a few facts. Over 50% of black pregnancies end in abortion (Blackgenocide.org). The liberal mainstream media (CNN, MSNBC, BET, etc.) and the Democrats relentlessly promote the myth that "white conservative Republicans" are burning the midnight oil thinking of ways to suppress black America. Isn't it ironic that not a white Republican's, but our black Democrat president's abortion policy contributes greatly to black genocide? Let's talk about gay marriage. Yep, Obama is sympathetic to it. (http://www.youtube.com/watch?v=73oZ_pe1MZ8) Obama opposed the Federal Defense of Marriage Act which defines marriage as a legal union between one man and one woman. Obama said he would support civil unions between gay and lesbian couples. He also supports individual states deciding if marriage between gay and lesbian couples should be legalized. I would also like to tackle the whole "entitlement" thing — folks believing they have a right to reap the benefits of someone else's labor. Obama is diligently fulfilling his promise to Joe the Plumber to "spread the wealth around." The Bible says that if a man does not work, he should not eat (II Thessalonians 3:6-12). Yes, the Bible does highly regard giving/charity. But it does not support government confiscating wealth for redistribution in the name of "social justice." That is not what Jesus would do. As a matter of fact, Jesus said, "The poor you will have with you always." Why? Because it is impossible to regulate outcomes in life. Obama skillfully plays the class envy card, getting those who have less to hate those who have more. Then they will gleefully support him brutally taxing the rich SOBs. 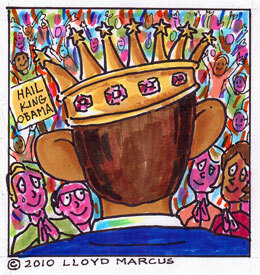 Obama is exploiting the human tendency to sinfully covet the possessions of others. 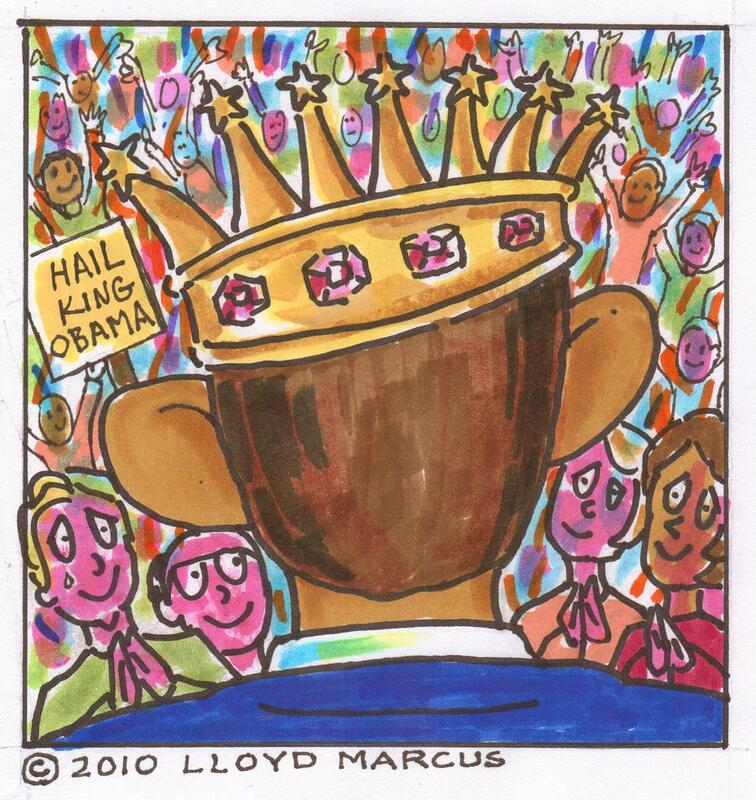 Obama also shamelessly plays the race card to get his way — not directly out of his mouth, but through his minions. The liberal mainstream media and the Democrats are promoting the lie that the millions of whites who voted for Obama and have since become tea-partiers because they reject his big government agenda are suddenly racist. This is an evil and divisive control tactic. And here is a major kick in the face to Christians. During his presidential campaign, Obama told the world America is not a Christian nation. (http://www.youtube.com/watch?v=QIVd7YT0oWA) Now, as president, Obama canceled the 21st annual "National Day of Prayer" ceremony at the White House which was started by President Truman in 1952. Obama stated his reason as "not wanting to offend anyone." Now here's the kicker. A National Day of Prayer for the Muslim religion was held on Capitol Hill, beside the White House, September 25, 2009. As many as 50,000 Muslims attended. So apparently, Team Obama has no problem offending Christians, but he is extremely sensitive to and even honors Muslims. My fellow black Christians, these are only a few easy-to-research examples of Obama/Democrat agenda policies which do not line up with Christianity. For those of you who cannot handle the truth, I will keep you in my prayers. It is not my place to judge you. I am simply the messenger. But then, we all know what traditionally happens to messengers. God bless.